Angerboda’s name is related to “foreboding”. This witch Goddess is a mysterious, fiercely independent, private spirit. It is not clear which, if any of her known names is her true one. She may or may not be the same Goddess as Gullveig. The two star in different but related myths that is strung together form a cohesive narrative. Not only is Angerboda’s identity unclear, but She is also virtually impossible to classify; She may be a giantess, a troll-queen, a member of the Vanir pantheon, or some or all of the above. She may be old Loki’s twin sister. She may be something so old She defies definition. She is a shape-shifter, which accounts for some of this confusion. Angerboda is a Goddess of death and destruction as well as birth and life. She is Freya’s personal messenger. When a childless king and queen petition Freya’s help, She sends Angerboda to them in the form of a crow, bearing an apple of fertility. The queen quickly conceives and bears a child. Gullveig means “power of gold” and She may be Angerboda’s alter ego. She may also be known as Heid, the “shining” or “gleaming” one. Gullveig asks the Aesir for a gift of gold for the Vanir into whose territory they have moved. The Aesir call Her a witch and condemn Her to death. Thor seizes and binds Her, and She is pierced with spears like a pig on a spit and roasted on a pyre. She burns, Her ashes are scattered, and yet miraculously She reappears, alive and good as new. The Aesir recapture Her and repeat their actions. Gullveig is burned and resurrected three times. Angerboda returned to life in Valhalla twice, but the third time She found Herself in Her home, the Iron Wood. She never re-enters Asgard because the Aesir long to destroy Her. The Vanir, appalled at her treatment, declared war on the Aesir and attacked via magick spells, precipitation a brutal war between the pantheons. Angerboda’s children include Hel, Queen of Death, the Midguard Serpent, the Fenris Wolf, and the wolves responsible for solar and lunar eclipses. Other sons are identified as werewolves. She is the grandmother of Trolls. Angerboda is a weather Deity capable of raising storms. As the Hag of the East Winds, her songs drive ships into storms. She can be petitioned for lessons in magick and to foretell the future. FAVORED PEOPLE: Witches and those who protect wolves. 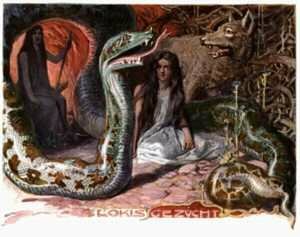 SPIRIT ALLIES: Her children and grandchildren, Loki, and Vanir Deities, especially Freya. Do not venerate Her side by side with Aesir Deities.